This volume is the product of the author’s long experience with melanomas and sarcomas and to a lesser but significant degree with upper gastrointestinal cancers, colorectal and breast cancers. As such, it offers a “hands-on” practical guide to approaching complex soft-tissue tumors and for performing more extensive tumor resections based on over 40 years of surgical experience. It provides important details about the positioning of patients, incision types, and exposure which can be of paramount importance in the resection of certain tumors. The book contains important general surgical principles for approaching tumors in a variety of locations but also offers the detail necessary for the safe and oncologically sound resection of these malignancies. Moreover, this operative atlas contains specific information for procedures which are not as commonly encountered in surgical training, but can be invaluable in the management of patients with locally aggressive tumors, such as hemipelvectomy and its variants, sacral resections, and forequarter amputation. 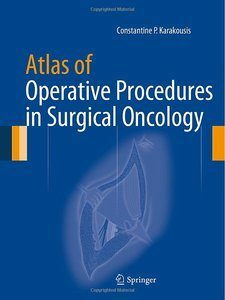 Through the use of multiple detailed illustrations, Atlas of Operative Procedures in Surgical Oncology serves as a valuable resource to the general surgeon or surgical oncologist in the operative management of patients with cancer in the abdomen, retroperitoneum, pelvis or extremities.